A "special order only" item, which we can order in for you. For these, please expect a delay of up to 3 weeks in addition to our normal delivery times. In its loving, fierce specificity, this book on how to die is also a blessedly saccharine-free guide for how to live (The New York Times Book Review). Former NEA fellow and Pushcart Prize-winning writer Sallie Tisdale offers a lyrical, thought-provoking, yet practical perspective on death and dying in Advice for Future Corpses (and Those Who Love Them). Informed by her many years working as a nurse, with more than a decade in palliative care, Tisdale provides a frank, direct, and compassionate meditation on the inevitable. From the sublime (the faint sound of Mozart as you take your last breath) to the ridiculous (lessons on how to close the sagging jaw of a corpse), Tisdale leads us through the peaks and troughs of death with a calm, wise, and humorous hand. Advice for Future Corpses is more than a how-to manual or a spiritual bible: it is a graceful compilation of honest and intimate anecdotes based on the deaths Tisdale has witnessed in her work and life, as well as stories from cultures, traditions, and literature around the world. A Good Death: What does it mean to die a good death? Can there be more than one kind of good death? What can I do to make my death, or the deaths of my loved ones, good? Communication: What to say and not to say, what to ask, and when, from the dying, loved ones, doctors, and more. Last Months, Weeks, Days, and Hours: What you might expect, physically and emotionally, including the limitations, freedoms, pain, and joy of this unique time. Bodies: What happens to a body after death? What options are available to me after my death, and how do I chooseand make sure my wishes are followed? Grief: Grief is the story that must be told over and over...Grief is the breath after the last one. 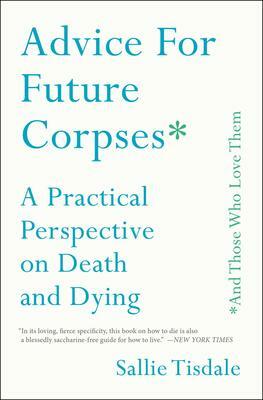 Beautifully written and compulsively readable, Advice for Future Corpses offers the resources and reassurance that we all need for planning the ends of our lives, and is essential reading for future corpses everywhere. Sallie Tisdales elegantly understated new book pretends to be a users guide when in fact its a profound meditation (David Shields, bestselling author of Reality Hunger).